What's BlueGFX Expo all about? BlueGFX Expo is a superb opportunity to learn about the latest developments in our industry. Attendees will have the opportunity to meet industry folks and try out the latest products. Last year speakers included Tom Box from Blue Zoo, one of the UK's biggest TV animation companies, Stuart Penn from Framestore, and experts from Autodesk showing the latest tools. For all our students, BlueGFX Expo is a great chance to catch up with new technology and meet in person people from the UK's top animation and visual effects houses. BlueGFX Expo is always well-attended by recruiters from London's animation and VFX houses, scouting for talent. Having the opportunity to meet recruiters in person is a great opportunity - you become a human face, not just another cv in an in-box. Registration isn't open yet - but mark your calendar and make sure you sign up early. The BlueGFX annual expo is on Thursday November 21st and lasts all day. At the Coin Street Centre on London's South Bank, just across Waterloo Bridge (see photo above). The address is 108 Stamford St, London, South Bank SE1 9NH. See the map below, courtesy of Google Maps. 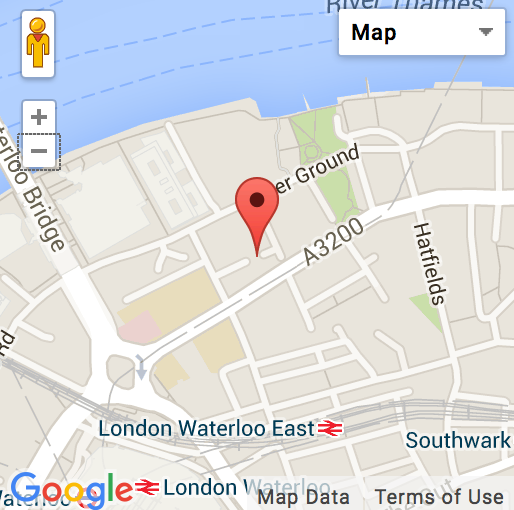 The Coin Street Centre is 5 min walk from Waterloo train and tube station and Southwark tube station. You can also take the Tube to Embankment and Temple, and then walk across the river. When you get to Stamford Street, look for the big yellow modern building.